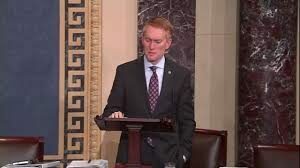 Oklahoma U.S. Sen. James Lankford is making a case to other U.S. Senators that they should vote to confirm Oklahoma Attorney General Scott Pruitt to be the Administrator of the EPA. In a Friday-morning speech on the Senate floor, the Republican Senator noted how Pruitt’s been “beaten up” lately by environmental groups and opponents. But he said Pruitt will be the kind of Environmental Protection Agency administrator who will follow the law. And the Senator said that’s just what some previous EPA administrators have done. He said Pruitt won’t be creative with the Clean Water Act, nor with the Clean Air act. Listen to his Senate floor comments about Pruitt.